Technology Reference Model for Stage 5 Maturity Supply Chain Planning - E2open | Demand. Supply. Delivered. Leverage Gartner’s Stage 5 maturity vision to move forward on your supply chain journey. “Traditional supply chain planning will not work in a fast-paced digital world,” according to Gartner. * To reach their full supply chain planning (SCP) potential, companies must seek to combine Stage 5 planning maturity, planning digitalization and algorithmic planning through next-generation technologies. 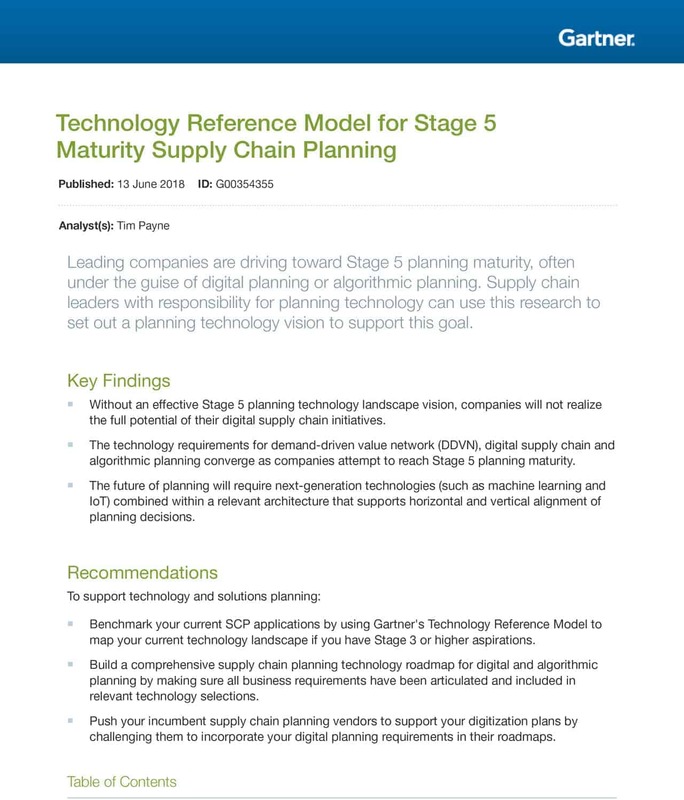 In Technology Reference Model for Stage 5 Digital Planning Maturity, Gartner recommends creating an SCP technology roadmap and enables companies seeking to advance to Stage 3 or higher to benchmark their existing applications. A convenient reference model diagram provides a blueprint for success. The report also covers three mega trends that drive leading SCP decision-making processes. Access this critical research to identify opportunities and gaps in your planning environment and pursue your vision for optimized SCP. *Gartner Inc., Technology Reference Model for Stage 5 Maturity Supply Chain Planning. Tim Payne, 13 June 2018.